A Campaign and Campaign Activity are separate from the standard hierarchy of the CRM. They do not sit under a Division or Contact. A Campaign usually outlines the overall event which is due to take place and the Campaign Activities are individual actions to be taken. For example, you may have an exhibition which would be the Campaign, but may have several marketing activities which need to take place beforehand such as advertising emails, telemarketing, letter invitations etc. - these would be the Campaign Activities. The first step is to create a Campaign in the CRM. This is done by clicking on the + icon on the right-hand side and then selecting 'Campaign'. This will then open a new record window where you can add information about the Campaign. Remember this is the overall, umbrella Campaign, so keep it quite general. It helps to add the year in which you are running this Campaign e.g. Manchester Expo 2018 Q2 - this will make it easier to search for the Campaign at a later date. 'Managed By' - This is a user of the CRM who has overall ownership of the Campaign. This is for internal reporting purposes only and does not restrict other users in the CRM from taking over ownership if anything were to change. 'Total Budget' - A value can be associated with the Campaign to help keep track of spending and also be compared to any Quotes which are created and associated with the Campaign. This is for internal reporting purposes only, and is not necessary to fill out. 'Start Date' and 'End Date' - This is the period which the whole Campaign will be active for. For the example above the exhibition may only last a weekend but all the individual marketing activities will happen before and after that. This is for internal reporting purposes only. Once you have entered the required information simply click on 'Create'. This will then create the new Campaign and allow you to add a more detailed description as well as altering any of the information you entered previously. The tabs on the left-hand side will show you any Activities which have been created, Leads which have been associated with the Campaign, Contacts in the CRM who have been added to an Activity and additional Email Marketing information. To create Activities under the Campaign, click on the + icon and select 'Campaign Activity' as shown below. This will then allow you to enter information about the Activity being created. Please note: if you wish to log Leads against a Campaign Activity (i.e. we had 3 new sales from this e-shot), then make sure you keep the end date fairly open-ended. As with the original Campaign which was created, you are now able to edit the details entered previously as well as add some additional ones. The 'Categorisation' section allows you to determine what type of activity is taking place. This is then used on a Lead record when selecting the Source and will tie the two together so they can be reported on. This allows users to know how many Leads and Quotes were created against the Campaign Activity. They type drop down can be altered using the configuration option if you have the correct level of authority within the CRM. 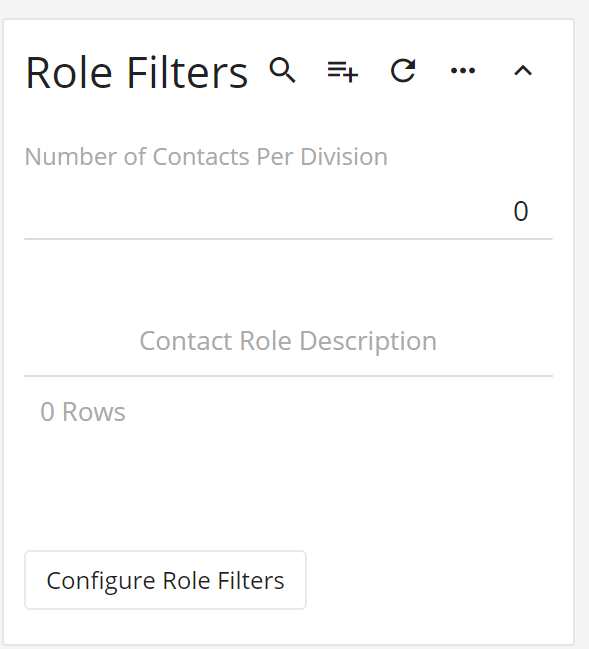 Filters are used to determine which Contacts will be allowed to be included in the Campaign. These options relate to the Communication tab on a Contact record where you select the preference flags. It is very important to make sure that only Contacts who want to be contacted are included in your list of Contacts on a Campaign Activity. If you make any changes to the filters then you will need to click on the 'Apply Filters' button to re-apply and update these changes. Finally, you can also filter by role to ensure you're targeting the correct audience. For example you may wish to only send to the Managing Directors & Sales Directors. Furthermore, you can limit the number of contacts per division that you include in the target audience. For more information about adding Contacts to a Campaign Activity please see our related article here. Once you have added the Contacts to the Campaign Activity they will be listed under the 'Target Contacts' tab on the left-hand side. The Campaign Activity will also show against any Contacts who have been added. This list can then be used as a calling list or uploaded to CommuniGator if the integration has been set up. For more information about creating a Campaign and Campaign Activity please see our video below.